Shield Vert, two grapevines Or leafed Argent ordered per fess, in chief two olive branches Argent crossed per saltire fruited Or, in base a well Argent pouring water of Azure and Argent. Mural crown Argent with three visible towers (village rank) and white scroll (sometimes in Bénard Guedes style) with inscription in black initials "PERABOA". Grapevines and branches are representing viticulture and oliviculture, the main business lines. The well is part of the cultural heritage and had been a donation to the commune of the Dukes of Lafões. 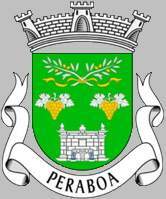 Peraboa Commune is one of the 21 communes of the Covilhã municipality (q.v. ); it had 953 inhabitants in 2011 and covers 27.2 km².